We were talking about the Black Death, or Black Plague of the 14th century in my Dawn of the Renaissance course. It really hit Florence hard in 1347-1348. Something like two thirds of the population of 120,000 of Florence died. No one knew what was going on or had any answers. So, one common response was that 'we are being punished by God for something.' Along those lines, and to file under ironic, were the self-flagellants whose goal by some accounts was to help absorb God’s wrath. You could even pay a flagellant to flog himself if you weren’t inclined to flog yourself. 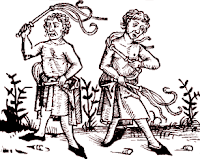 The flagellant movement became especially popular during the Black Death and ironically, roving bands of flagellants may have actually helped spread the plague. It’s a case of trying to defend yourself against something and only making it worse. The commissioning of art at least in Florence and other areas of Tuscany pretty much came to a halt. Who had time for art when everyone was dying? Those with means moved out of the cities and retreated to country estates and survived reasonably well. In fact after the plague passed, they came back to places like Florence and bought up quite a bit of land in these decimated cites on which they would build the grand palazzos of the Renaissance. But this didn't happen overnight, it took several decades to recover from the plague. The cause of the plague? There seems to be disagreement over whether it was a form of bubonic plaque (spread by fleas on rodents) or non-bubonic form (flea bite and respiratory spread). At any rate, it only took about one week to die. A scary time indeed.